We will keep our Monopoly Big Event slot review short: This is one of the best new slot machines we’ve seen in a long time. It might be a bit early to say since we are only in July, but it might be the best slot machine launched in 2015. You are welcome to check it out yourself. Below you can find few details and tips and here you can find Comparison of All Monopoly slot machines. Have Fun! There are many answers to this question, but there are t main ones: I can play it for hours with the same level of excitement. Second, if you play it right, meaning using the Big Bet feature, you get one of the Top 3 best paying slot machines online. Monopoly Big Event slot machine was actually developed by Barcrest, a famous British slots provider. So why it’s appears to be a WMS slot machine? Simple. 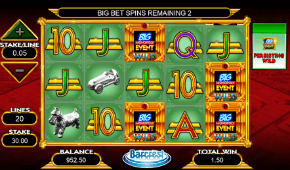 Both Barcrest and Williams Interactive are subsidiaries of Scientific Games Corporation Corp. Big Event was developed by Barcrest, brought online by WMS and you can find it in online casinos that feature this software, such as Slots Magic (the original WMS casino). 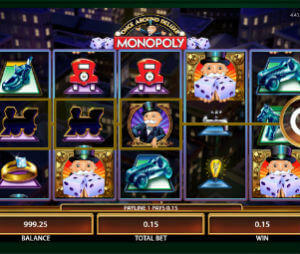 Monopoly Big Event is 5 reel, 20 fixed paylines slot. The minimum bet per spin is $/€ 0.20 and it goes up to massive $/€ 500. The maximum win is 250,000. We won’t go over all the bonus features available at Monopoly Big Event. It will take too long and you’ll skip it and just start playing. The only part we wish to go over is the Big Bet features, cause it can seriously increase your winnings odds. First thing you should know, is that all Big Bet games are active for 5 spins. When you click on the Big Bet button on the right side of the slot you will be presented 2 options: Progressive Multiplier or the Bonus Wheel. The price of this game is 20 credits for 5 spins. What is special here is that the multiplier grows with each spin, from x1 to x5. The price of this game is 30 credits. Here you will be given access to 3 different bonus features: Progressive Multiplier, 5 Epic Spins and Persisting Wilds. The Bonus Wheel will spin and decided which bonus you get to play. The Progressive Multiplier is a similar feature to what we explained before and it’s the least rewarding of the three. 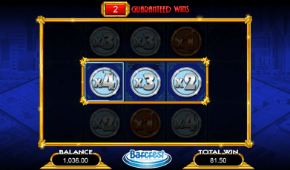 Epic Spins: Here you will get 5 spins with x5 multiplier. Persistent Wild: From our experience, this is by far the most rewarding bonus feature. Each Wild that appears on the screen remains in its place for the rest of the bonus. The wilds appear quite often and you can easily finish the 5 spins with 7-8 wilds and more. The bottom line: with regular play – the expected return of Monopoly Big Event slot is 96%, which is ok. If you play using the Big Bet feature, your expected return jumps to 99% – which is superb! Between the 2 Big Bet options, we enjoyed more the Bonus Wheel feature – it’s more fun and seems to generate higher payouts. At this point there are not many WMS slots available on mobile, therefore Monopoly is a nice exception. It was developed with Mobile players in mind: the graphics work well on the small screen and the controls are smooth and easy to use. You can play it on all mobile devices, including Apple, Android and other smartphones and tablets.